Suzi Kaplan Olmsted and Peter Marti will be reading for Sparring with Beatnik Ghosts on Friday September 28, 2012 at the Beat Museum (540 Broadway, San Francisco). 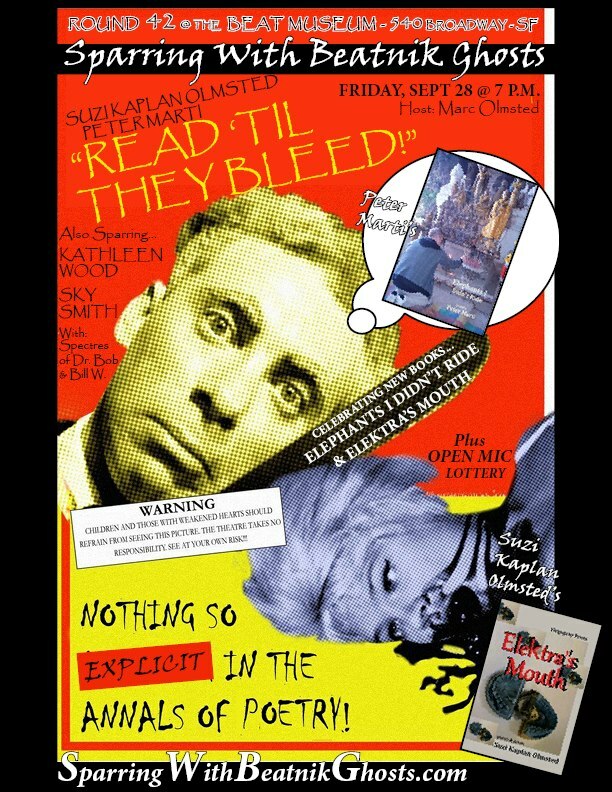 Suzi and Peter will be reading from their new publications: Elektra’s Mouth (Olmsted) and Elephants I Didn’t Ride (Marti), both Virgogray Publications. Poet, Marc Olmsted hosts, other poet guests include, Sky Smith and Kathleen Wood. Poetry open mic lottery to take place! 7 PM, brought to you by Marc Olmsted and Sparring with Beatnik Ghosts.